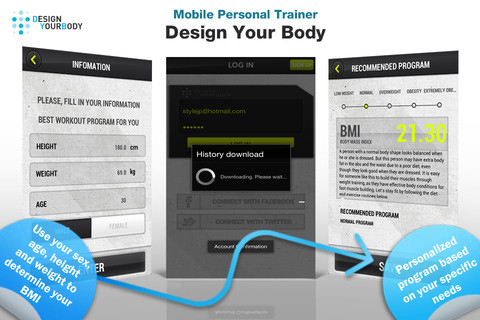 Design Your Body iPhone App Review. With the holiday season just around the corner, we'll probably find ourselves in January with a couple of extra pounds we want to get rid off. That's when Design Your Body steps in. With a complex exercising program, Design Your Body knows just what you need to do to lose those extra pounds, or maintain your current weight. And you can have it all with a single purchase from the AppStore. Design Your Body focuses on the exercises you need to do to maintain or lose weight, rather than what you should eat to get the wanted result. 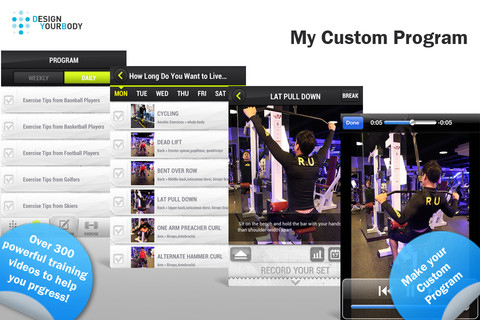 From Pilates to Fitness exercises, this app knows all the tricks to help you design your body. With a large range of exercises that allow you to work out your entire body or just the muscles that need to be worked out the most, Design Your Body is all you need to stay fit. Along with a balanced diet, of course. Once you create an account and submit some basic info regarding your weight, height and gender, Design Your Body will generate your daily exercising program. This will include Fitness or Pilates exercises, depending on the routine you are interested in. And don't worry. Even if you probably come across a busy exercising schedule, you can tick the activities you're most interested in and add only those to your daily routine. Every type of exercise comes along with a video and a set of specifications, so that you'll know the right way to perform each exercise. Some videos might not load properly, but the instructions are helpful enough to suffice. Also, you can try other types of activities than the ones generated for your daily routine. Try all types of stretching and muscle exercises, and check out the equipment you need to properly perform each one of them. And when you come across an exercise that you find really useful, remembering it is as easy as adding it to your daily routine. In addition, Design Your Body also has a list of daily and weekly tips. Get exercise tips from baseball, basketball and football players, swimmers and skiers. Learn how to develop strong arms and legs, broad shoulders or perfect abdominal muscles. And so much more! Personally, I found Design Your Body to be useful, but not quite as intuitive as I would have liked it to be. The daily routine is a bit confusing at first, because you don't quite get it if you have to do all those exercises, or just pick the ones you want. And adding an activity requires one extra tap that could easily be removed from the process. Plus, Design Your Body is also a bit unresponsive the first time you use it. But once you go through all the exercises once, you won't have any problem loading them the second time. All in all, Design Your Body is pretty good as it is, but it would be even better should some of these minor problems be fixed. But if you like to exercise, Design Your Body is definitely the app for you, no matter if you're looking to drop some pounds or just maintain your current weight. 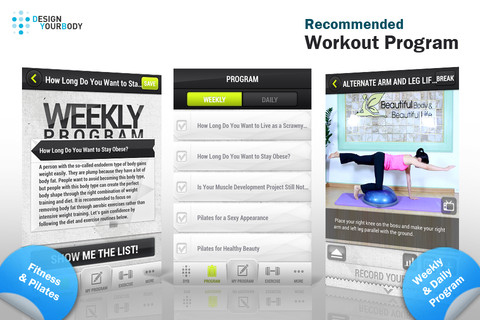 Developer: Design Your Life, Inc.
What do you think of Design Your Body ? Scroll down for our comment section and let us know! Take that Stair Master 2000! Stay on top of your calory count with Lose It! another worry. We had these issues. Otherwise Disqus is simply great. interesting... model in the movie looks good!